The main driving power of the working sail plan of a multihull is derived from its mainsail. Typically they are fully battened and loose-footed to permit maximum camber adjustment. Due to the higher speeds of multihulls, sails are frequently cut much flatter and, generally, are also of heavier construction than those on a monohull. Mainsails can have large roaches, which increase their area up high, where it counts. Winds aloft usually are stronger, and being able to capture them is of great advantage, especially in light air. Fully battened mainsails can have up to 60% more surface area than a conventional 18" roach as seen on the typical monohull main. The additional area can be applied either to making the boat go faster, or to reducing the rig height and the overall Center of Gravity (CG). But the efficiency of the sail plan increases with its aspect ratio, and the taller the luff is, relative to the length of the foot, the more power the rig will generate. However, care must be taken that the Center of Effort (CE) is not moved too high as that will affect stability, and might even induce pitching, which compromises airflow over the sails. Interestingly, the phenomenon of weather- and lee-helm on a catamaran can work in exact opposition to what is known to be true on a monohull. As the catamaran heels, it moves the CE athwartships and forward. As the hulls are depressed, the Center of Lateral Resistance (CLR) also edges towards the bows. Again, a delicate balance must be found to provide the most power with the least consequences in stability. 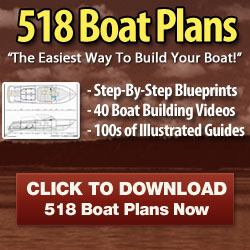 Designers have to dial in the correct sail area for each specific boat and application. A multihull should not be under-canvassed in light air nor easily overpowered in stronger conditions. Aside from mast height limitations and practical aspects of sail handling, the total sail area needs to allow for adequate performance and must be shared between mainsail and jib. Both sails, in turn, have to be in harmony with each other, since their combined Center of Effort (CE) is in direct relationship with the Center of Lateral Resistance of the underbody (CLR). Most of the lift is developed at the leading edge of the sail where the low pressure zone is responsible for the forward drive of the vessel. Observe the varying strength of the forward force vectors and how they are distributed over the chord of the sail. The lowest pressure is generated in the first 20% of the width of the airfoil and the resultant total force acts through the Center of Effort at about one third aft of the mast. above To eliminate cluttered decks some catamarans lead all sail controls via conduits underneath the bridgedeck to a centralized winch in the cockpit. Although this keeps lines neatly organized, any line knots or break could involve cumbersome rethreading, possibly under difficult circumstances. 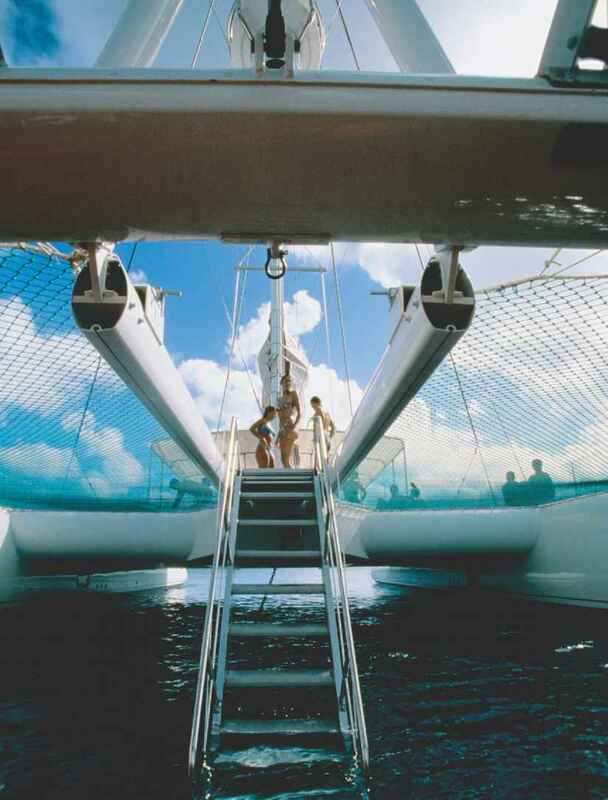 catamaran's main will decrease material and human stress levels as there is no wild luffing, and the noise of the flogging sail will be completely eliminated by the stiffness of the battens. A catamaran's mainsail is silent and its shaped battens force the sail into an airfoil curve. That is especially helpful in light winds when there is not enough air pressure to stabilize a battenless sail and make it draw. Battens support our mainsail's roach and they help us reef and stow the sail. Additionally, they prolong the life of a mainsail, since they spread the forces evenly across the cloth and prevent the material from moving and creeping. The best feature is their adjustability although only a few catamaran sailors take advantage of this. Screwjacks on either end of the batten pockets permit tensioning, consequently, one can change the curvature of the batten. That, in turn, will shape the chord of the mainsail. Of course nothing is perfect. Fully battened mainsails are not cheap, they can be heavy and, above all, airflow over them is difficult to read as they are so stable. Also, if one is not careful when gybing, one can also break them and single-handedly changing a batten on a 64 foot multihull at sea is not easy. 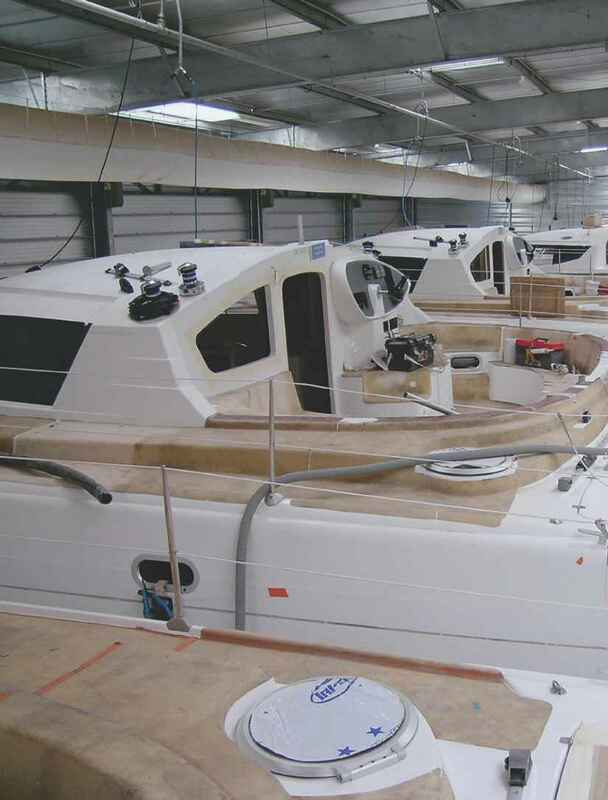 Sailmakers have worked hard to make battens more reliable and nowadays they come in a variety of materials; solid or hollow fiberglass or carbon tubes are the most popular. Usually mainsails are loose-footed along the boom. Their flatness is controlled primarily by the outhaul, mainsail traveler and sheet. Running backstays, if applicable, will assist too, while halyard tension and Cunningham controls move the draft forward. Sails for multihulls have to be of bulletproof construction and reef points should be heavily reinforced, much more so than on a monohull. In the monohull world, boat weight dictates the thickness of material to be utilized to build a sail, leading to the deduction that a light multihull can get away with light sails. In fact, quite the opposite is true. The lighter the catamaran, the faster she will accelerate and the more pressure the sails will feel, necessitating extra heavy and flat sail construction. Luckily, advancements in sail materials, such as new Polyester composites, Carbon, Spectra and Kevlar are innovative fibers, which are both strong, light, and are ideally suited for multihulls. Considerations such as cost, durability, UV protection, chafe resistance and hygroscopic characteristics will be other factors that will dictate which sail construction to use. the forward force against the mast track. Modern mainsail tracks and batt-car systems will assure that you can reef the mainsail even downwind. This is my preferred heavy-weather technique, especially when shorthanded in big beam seas. The battens at the luff of the main are usually nesting in an end fitting, which has a freely articulating-but-strong attachment to the mast track car. The majority of these sliders rely on Delrin or other UHMWPE (Ultra High Molecular Weight Polyethylene) balls to reduce the compression load and friction of the mainsail. These ball-bearing type of cars must be carefully maintained since frequent heavy use eventually will result in failure. As an alternative one could opt for ball-less batten cars, which reduce friction via a Teflon-coated inner material. Although they might not be as efficient as roller-type fittings, they will need no maintenance other than an occasional hose down with fresh water. Working headsails come in two varieties: the self-tacking jib and the overlapping genoa. Both have their merits and drawbacks. below Some catamarans feature forward cockpits, which are located ahead of the saloon windows. The crew sits directly aft of the mast and all sail controls are close at hand. Sail adjustments on multihulls, especially those that are fast, will have a greater effect on the vessel's response than sail trim on a slower monohull. The magic of apparent wind can radically change the angle of airflow, greatly influencing a catamaran's performance. Therefore, main and headsails have to be cut much flatter, unless the boat is heavy, which would require more powerful, deeper draft sails. 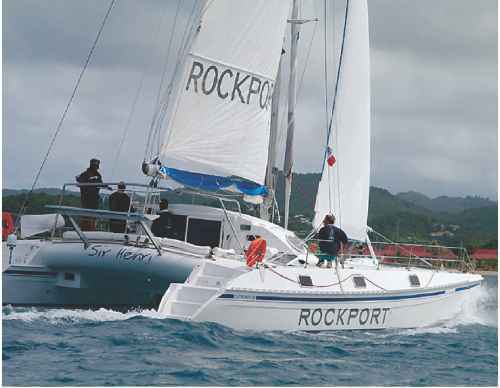 above "Rockport," an Outremer 45, winning yet another ARC Transatlantic Race. Although not as roomy as other cats in their class, the Outremer multihulls are known for their performance and strong, reliable construction. 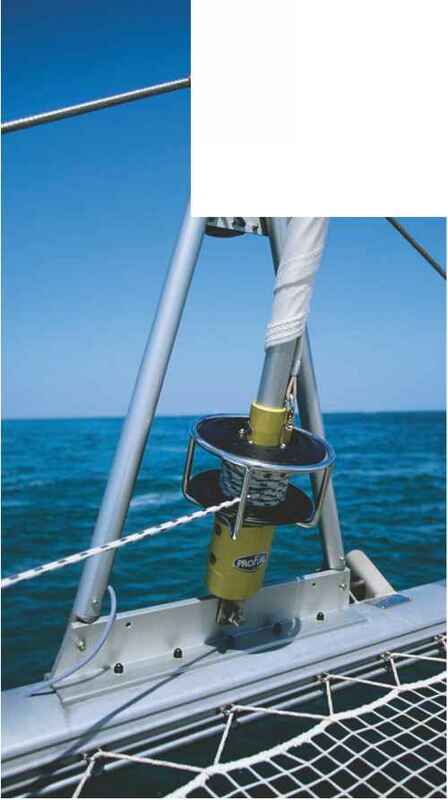 far right Two common rig and sail handling features found on modern catamarans: the so-called "Seagull Striker," as seen here with a wire tensioner, and the reliable jib furler. Care should be taken to have enough wraps around the barrel and to lead the furling line fairly away from the drum in order to avoid reefing problems. Whereas the self-tacking jib (the French call it "Solent") only has one sheet, it can swing through the wind without having to release the old and trim the new windward sheet, as on a genoa. The self-tacking jib, similar to the mainsail, has a huge wind window and a wide range of applications. It is a highly versatile sail and, if properly cut and reinforced, it can be reefed and used as a storm jib. Opponents might argue the added windage and inefficiency of a rolled up jib replacing a proper, hanked on storm jib. In my opinion, especially in extreme conditions, it is safer to stay in the cockpit and quickly roll the jib to a manageable size, rather than delaying the decision because of the risky trip forward to deploy the storm jib. We often have used the heavily reefed Solent successfully, even in F10 conditions and never felt the need for a storm jib. In case one is forced to sail to windward in heavy weather, a proper storm jib would certainly have the edge. However, if one has a choice when sailing in big winds and seas, it is always more comfortable to be sailing with the system. For that purpose a rolled up self-tacking jib is just perfect. 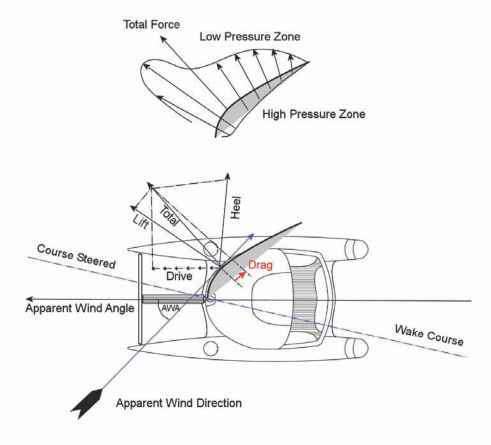 Roller-furling mechanisms are key devices for safe multihull sailing. They must allow smooth operation in any condition. The last 20 years have brought great advances in the engineering of sailboat hardware and long gone are the days when furlers would suddenly fail. 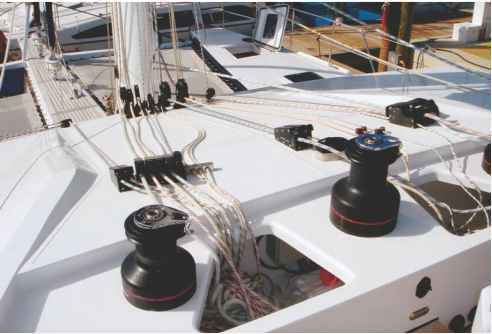 There are a variety of manufacturers that make extremely reliable roller-furling hardware for any type of catamaran. A self-tacking jib makes a lot of sense when single handing, or short tacking up a channel. Draft and twist can be adjusted with the sail's own jib track, which is usually just ahead of the mast step. 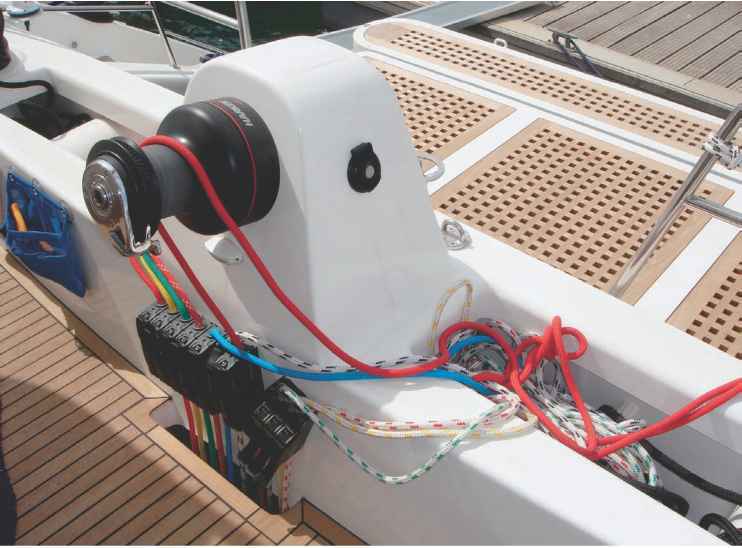 To fine-tune it, barber haulers can be fitted to adjust the important slot between the mainsail and the jib. Especially if one is expecting to sail in strong wind conditions, the self-tacking jib (and autopilot) will become your best and most dependable friends. In contrast to the self-tacking jib, the genoa is a headsail that is still seen on most monohulls. Since the clew of the genoa overlaps the mast, it requires a windward and leeward sheet to control it. One cannot tack without undoing one and trimming with the other sheet. The genoa, apparently invented by an Italian sailor, is a sail that will provide more power than the Solent. This is also the reason that it is utilized by most medium-displacement cruising catamaran manufacturers. Similar to the self-tacking jib, it can be rolled up and reefed to handle stronger conditions. on a soft luff, typically flown from a bowsprit. They are sheeted to a block way aft on the outside rail and, depending on the wind speed and sea state, can be flown from a range of 45 to 170 degrees of apparent wind angles. Unlike the genoa and Solent, they cannot be reefed. Usually they employ a Spectra luff and need careful attention when it is time to take them in. Similar to reefing a multihull's mainsail in stormy conditions, and in exact contrast to our instincts, multihulls should have the wind aft of the beam when furling them. This will reduce the pressure and apparent wind, and make the operation manageable. Sailing downwind on a catamaran is a pleasant experience and is not hindered by the distracting motion of monohull type rolling. Spinnakers come as two types, either symmetric or asymmetric, depending on their cut. Neither of these strictly downwind sails rely on cumbersome spinnaker poles and reaching struts, as found on monohulls. The faster the multihull, the less a spinnaker will be necessary for downwind sailing, because the apparent wind will be brought forward. Gennakers will be used instead and the boat will be tacked downwind faster than running straight towards the destination. Besides, it is significantly more fun to have the wind in your hair and sailing on a reach than on a dead run. Spinnakers are usually hoisted to the same position as the gennaker, which is just above the hounds, or even to the masthead. A great innovation is the sock that the sail lives in. Like a giant snake, the entire contraption is hoisted before the sock is pulled up, exposing the sail to the wind. Similar to a monohull, sheets and forward guys stabilize the sail. "The most beautiful thing one can experience is the mysterious. It is the source of all true art and science. He to whom this reaction is a stranger -who no longer can pause to wonder and stand rapt in awe -is as good as dead, his eyes are closed." 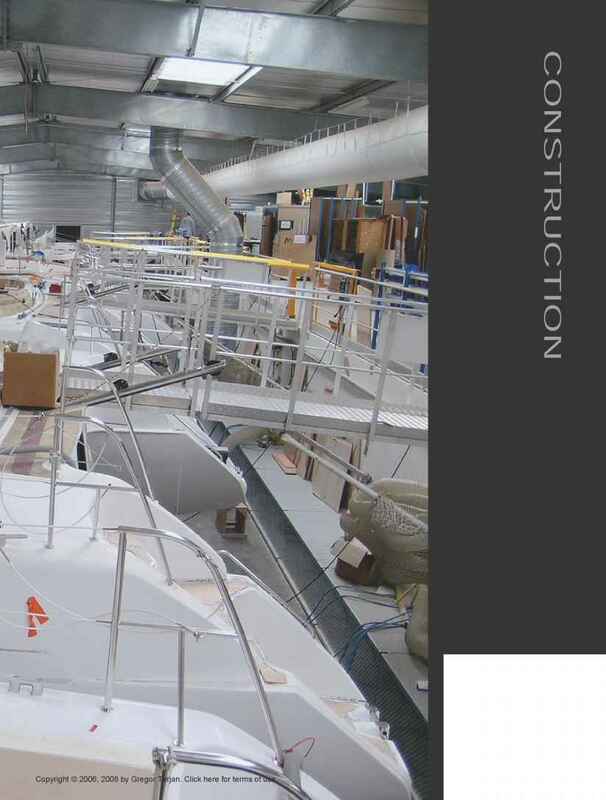 State of the art multihull manufacturing assures a consistent construction process, resulting in boats that will keep their value even after years of hard service, eliminating surprises as often found in a totally custom-built, one-off, project.